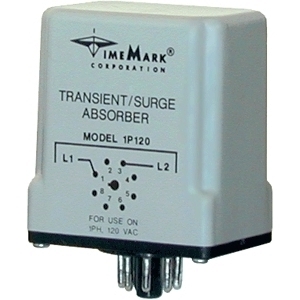 Transient/Surge Absorbers (TSAs) provide system designers with a cost effective method of protecting sensitive electrical and electronic equipment from damage caused by switching transients, coil and motor backlash, and near miss lightning strikes. There are 3 models available: single-phase (1P), 3-phase delta 3-wire (3PD), or 3-phase wye 4-wire (3PY). 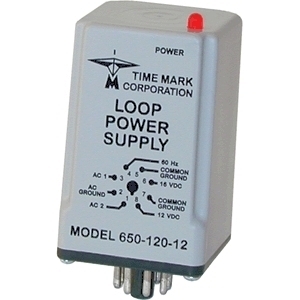 Each model is available to cover nominal AC voltages of 120, 208, 240 and 480. 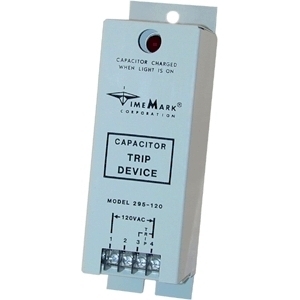 TSAs are designed using a ceramic and metal oxide technique which causes the resistance of the device to decrease abruptly if the rated voltage is exceeded. Voltage ranges are achieved by varying the types of oxide used in each model. Resistance changes are very fast, requiring less than 50 nanoseconds after the threshold voltage is exceeded. All models can repeatedly absorb in excess of 24,000 watt spikes without damage. The Model 421 detects an overload or under-load condition on all types of running motors; conveyor motors, elevator motors, mixer motors, submersible pumps, suction pumps, etc. 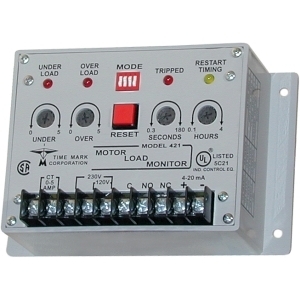 The monitor detects the actual power used (voltage x current x power factor) and is more sensitive than simple current monitors. 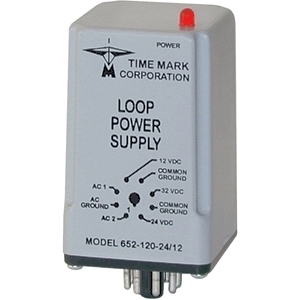 The Model 421 can be used with single-phase motors, or using the Model 276C Current Transducer, with three-phase motors. Matching CTs allow the Model 421 to be used with virtually any size of motor. Trip and restart delays are provided; one or both can be turned on or off.